Can We Build an Anti-Policing Movement that Isn’t Anti-Police? 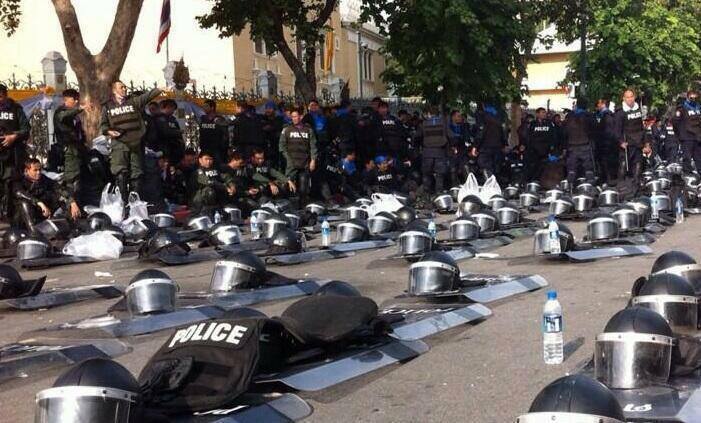 In 2013, when police in Bangkok laid down their riot gear and allowed protesters access to the Government House, many questioned whether it was a show of solidarity or sly strategy. Last week my immediate family came out with my friends and me to their first protest since the fatal shooting of Mike Brown. They were interested in getting involved in the movement, and my younger sister in particular had tons of insightful questions. The whole damn system is guilty as hell! Indite! Convict! Send those killer cops to jail! Since I was a young person I have been uncomfortable with the anti-police rhetoric of many leftist movements. Plenty of times I have been harassed, targeted, threatened and assaulted by police with no provocation. I have never been unfamiliar with the racist state violence that police represent. What always complicated my feelings was the number of police in my own family. All of my police relatives are poor people of color. They have their own histories of military service, lack of access to education and resources of all kinds. They have all struggled with anger, depression and partner abuse. They are most of them ultra-conservative, despite their oppressed experiences. Though their backgrounds and political views are complicated, almost all of them represent the exact populations for which the movements in which I am currently involved claim to advocate. In recent anti-policing actions and organizing that have been taking place around the country, I feel we as a movement have done an exemplary job of drawing connections between struggles—both in the present political moment, and historically. Black communities and their allies clearly understand and articulate policing as a tool used primarily to protect the rich from the poor, the white from the Black and Brown, the privileged from those upon whom their privilege is built. What I still feel is missing from our analysis is who police are and how they arrive at their position as the buffers which preserve the capitalist class structure. Leaders of the movement have correctly illuminated the inexorable connections between the current policing and prison systems, and their roots first in chattel slavery, then in the policing of newly freed slaves during reconstruction. A crucial point of this history, however, is that it was historically poor whites, representing the interests of the wealthy, who took on the roles of slave catchers, overseers and government-backed militiamen. By instructing poor whites to invest in their whiteness, economically oppressed people were bamboozled into identifying with the state, instead of with other socially and economically oppressed people, conveniently keeping the hands of the wealthy clean as the poorer classes clashed, and avoiding the larger insurrections that might have been possible had they united. This element of the policing system has also survived into the modern era. What might a movement against policing look like if police themselves joined in on a large scale? How can we shift our target so that we consistently take aim at the larger structures which oppress us—structures which often oppress the working, the unionized, the police themselves? Having asked these questions, working with police is not necessarily a tactic I advocate. This fatal mistake is how countless global movements have been disbanded, infiltrated and even militarized. For example, a co-worker of mine who identifies as trans refuses to work with the police precisely because she has done it before. Part of a radical collective that attempted to educate officers on trans identities and issues, the group disbanded when, instead of curbing attacks on trans people, police used the information they had learned to more effectively target, manipulate and intimidate them. The anti-war movement has long advocated for the human rights of troops, and created powerful bonds between itself and military vets. Yet, as many critics have correctly pointed out, these bonds are much easier to make when the activists involved are not the ones being bombed, shot and terrorized by the troops with which they organize. Having cops as relatives, I know all too well that they are prone to violence, and carry dangerous prejudices towards queers, women, immigrants and other groups in struggle. I also know intimately that it is policing itself which has engendered many of these attitudes and tendencies within them. The capitalist state first denies us resources and agency, teaches us we are without worth or power, then promises to return our agency to us if we become its violent representatives. Countless oppressed people in my family and community have fallen into this trap, and military and police recruiters know exactly how seductive the offer is. Anger and violent rage are valuable to these systems, and excessive force is encouraged and even demanded by them. If we are to truly understand who police are and how to most effectively combat policing as a system, the realization that policing does deep harm to those whom are coerced into participating in it must factor into our organizing strategies. I am not arguing for a shift in our tactics and rhetoric because I am worried about mainstream portrayals of our communities. I don’t ask that we change our tone to make our movement more palatable, or more welcoming. I certainly don’t want a movement that is less militant. I actually believe we can go deeper, do more damage, and lead more effective actions if we have a broader understanding of exactly what it is we are fighting for. As my sister correctly noted, our message is getting confused, and wherever we do not provide our own clarity, the state and others will intervene to turn our views against one another. I don’t believe justice for Mike Brown, or any other oppressed person murdered or tortured by the state, will come from locking up the individual law enforcement agents involved. I do believe it can come from a radical redistribution of resources in our society, one which could greatly aid in making policing obsolete, and might even benefit those who currently occupy the roles of police officers. And it is much more threatening to those in power that we demand they give up their hoarded wealth than it is that they lock up a handful of police who were, in fact, just doing their job. In many ways our movement is still condemning racist cops, failing to understand that the individual prejudices of police are not the issue: As long as there is policing, there will be people charged with keeping the oppressed in their rightful places, with violence as they see fit. We rally for indictments, for charges, for prison sentences, forgetting that the criminal justice system exists to jail us, and that as long as we continue to invest in it, we will overwhelmingly be the ones who fill prisons. We must use the incredible force we are beginning to see in ourselves to demand justice for all our people, for ourselves, and not just for the individual names who may have sparked our movement. We need to identify the structures that oppress us—not its individual representatives—as the targets for our action. We have—and must stay committed to—a well-organized movement that confronts and disrupts the state apparatus militantly. This means that, by definition, we will continue to go head-to-head with police in our streets, our neighborhoods and all the places we gather. This means, without question, that we will experience more racism, more transphobia, more sexism, classism and direct violence in the months to come. Police will see us as their enemies, even if we work to remind ourselves that they are merely the public faces of ours. How do we heal from this violence, and hold those responsible for it accountable, while maintaining our struggle in its complexity, and focusing it on those who represent the true barriers to justice? How can we build a movement with a long-term vision of solidarity and unification, even one that is not possible now? I’m not sure I fully understand the idea of eliminating policing altogether. Are you also talking about eliminating police? Or just the current mode/mentality that built modern policing? Because there will always be violent and criminal individuals in the world that need some kind of countervailing force for the safety of the public… Marx’s old “lumpenproletariat”. In fact, this is one of the oldest problems facing Marxists (and one that the Soviet system and other Socialist societies seldom got right): what do anti capitalist systems do about the problem of crime?